Many of our youth members, and quite a few adult members, aspire to a career in Aviation. Each year, Aviation Australia, a major aviation training provider, opens its Queensland facilities draws aviation training bodies and employers together for its Aviation Careers Expo – this year on Saturday August 24th, 2013. This is a brilliant event that caters to many of the needs, interests and career goals of career focused aviators from all origins. 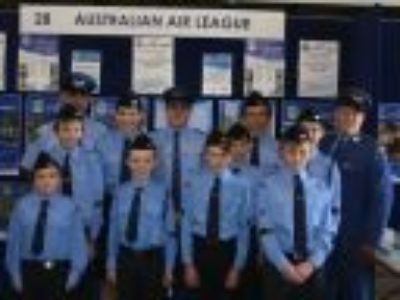 Aviation Australia again sponsored a huge Air League display space – which allows the League to actively engage people of all ages already actively interested in aviation and to raise awareness of Air League programs and youth development benefits. Staffed by uniformed personnel, our dynamic new display featured new posters, new flyers, a gliding prized donated by Gympie Gliding Club and an appealing “Youth on Target” paper plane challenge. Cadets & Officers also explored the many training exhibits and static aircraft displays in rotation for their own information. Air League parents from all attending squadrons also operated the main entry sausage sizzle on behalf of CareFlight, a not-for-profit community focused aviation organisation with common values, and in doing so were vitally important League ambassadors both to the public and in our affiliation with CareFlight. Queensland Group sincerely acknowledges the ongoing corporate and logistical support Aviation Australia and are greatly appreciative of the critical industry exposure, vital career pathways and industry knowledge that are made available to the League and our cadets through this event.